Are you feeling bold enough to take on huge waves of hop flavor? Looking for an IPA with over a half pound of hops for 5.5 gallons!? Well, you've found this burried treasure! 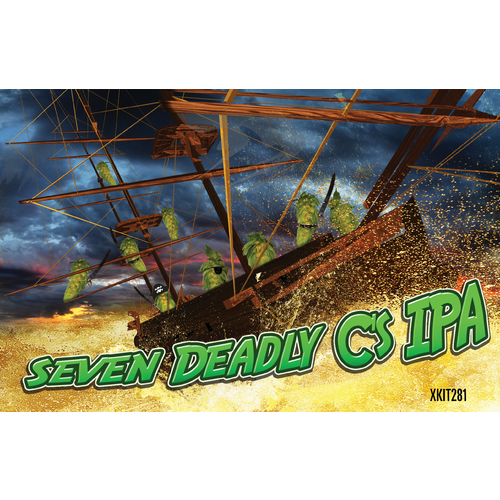 The 7 Deadly C's IPA is an incredible blend of seven different hops starting with a "C". With the interesting bittering characteristics of Cluster hops starting it off, to the tripple dry hop addition of Centennial, Chinook and Citra, this is one IPA that all hop lovers will enjoy! The full list of hops included in this kit are: Cluster, Citra, Centennial, Columbus, Crystal, Chinook and Cascade. 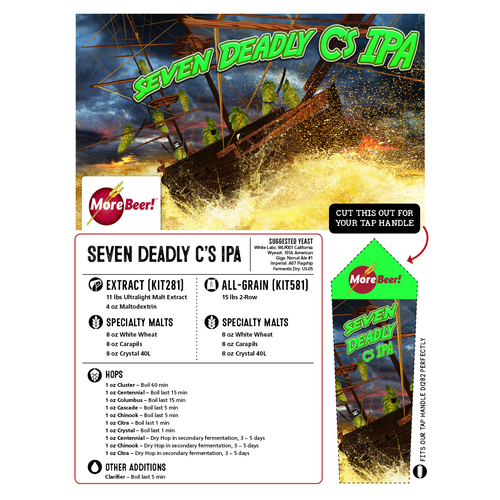 Order your 7 Deadly C's IPA today, and watch your boil kettle turn into a rolling sea of hops! brewed it before, really liked it. I like C-hops and this sounds interesting. I love brewing (and drinking) IPAs. I have not tried this one and the reviews made it sound like a good bet. This is now in my beer inventory. I'm going to modify this kit just a little bit ... and try fermenting it with Brett! Brewed this using WLP001 California Ale, beer fermented well. I gelatin fined and force carbed to 2.3 volumes at aprox 12 PSI with a 10' line and 40 F. The beer came out a beautiful color with just a touch of red to it. There was excellent head retention and a pleasant soft citrus aroma. The flavor was a combination of typical IPA citrus but with a solid malt backbone. One thing i was really impressed with was the smoothness of the bittering hops and the incredible drinkability with such a high IBU rating. Everything about this beer is great. Fruity, great nose, dangerously drinkable for being a heavy, and most importantly, absolutely great value for the money. I'm a week in the bottle, and just had to try one, for quality control reasons, of course. It is unbelievable now, one more week and it'll be even better. Try it out!!! 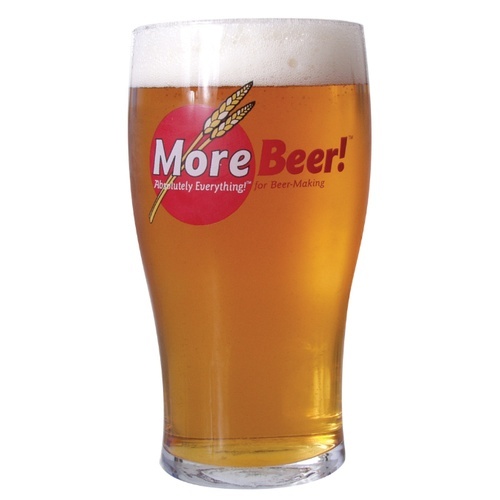 Thanks more beer! Another great kit. Hey , this was a great ipa recipe, a great value as well for all the hop adds .. my son in law and I each made one to see whose was best. Sadly both are gone now?? My favorite IPA hands down. This is a well balanced IPA. I often get the same question, "this is an IPA?" I e joy the citrus notes and the smoothness considering the Abv. An assertive blend of in your face hops. Had a bit more of a bitter finish than I would have guessed given the hop schedule which were mostly late additions. Not a drawback at all but this is definitely more of your classic west coast IPA than the wimpy approachable New England IPAs of late. My color came out a bit darker than pictured as well. Overall, very, very solid. This was my first IPA in a few years (i've brewed a black IPA every Year). I did BIAB. It turned out awesome. Its not really bitter. Amazing citrus and other great hops flavors. i would brew this again. Brewed this one for my wedding to go along with a Sweet Stout, Kolsch and a Pale. Wasn't sure what the crowd would enjoy so I wanted a variety. Well this Keg tapped out first. Those macro beer drinkers asked me several times what brewery I got the beers from they didn't believe me it was homebrew. I used the white labs Burton yeast it really brought out the citrus flavors. This is an awesome IPA that is superbly designed. The result is a very flavorful we'll balanced IPA with a nice white head and attractive colored brew that seems to be enjoyed by everyone. The majority of the large hop bill is designed to accent flavor & aroma yet has enough hop bitterness to satisfy even the serious IPA drinker. I have a bout three brews that I keep as a staple on tap but after tasting this one and experiencing the very positive reaction of others I'll be adding this one as well. Happy brewing! I add midnight wheat to make an awesome black ipa super smooth!! My 27th year brewing. A 5 star does not come easy from me. This beer was a surprise.This had a real distinctive taste to it. Will be making this again. I found this easy to brew. I sparged too quickly though so my OG was low, but beer came out great nonetheless. Kegged it and is really good. Going to brew again and sparge slower next time. Have to admit that being an IPA lover I've never expected what I got with this one. Flavors are amazing! Don't be scared of the huge amount of hops... it is not a bitter IPA, it is fruity and not kidding the word sweet came to my mind with the first sip. Mango, papaya, citrics, etc. Excellent beer even for a non IPA drinker! I went just a little down on the ABV but even though I'm really enjoying this one! This beer was very active during fermentations. Of course I put in 3 vials of wlp001 so it was to be expected. Hit gravity dead on. Only change I made was I added 2 ounces of citra right before crashing to do a second dry hop. As if this beer needed anymore hops, but what the heck. Amazing ipa. Tons of hop presence. Tons of hop presence without being too bitter. Hard to have just 1. Probably 1 of the best ipas i have brewed. Been brewing for 3 years now, and this has to be the best IPA that I have brewed. I was worried with all those hops that the flavor would be too strong and hoppy, but it is the right balance. I strongly recommend this beer. This was my first all grain brew. Really nice, medium strength IPA with a ton of citrus on the nose, balanced malt/bitterness, and unfortunately was consumed too fast. Lesson learned from this guy was to get a hop spider as the amount of hops really made a brewpot mess. Highly recommended. I've made both the extract and all grain versions of this beer and both are truly outstanding. It has an amazing hop aroma and a very complex hop flavor without being too bitter; some IPA's can be so bitter they verge on being something you would use as a practical joke on your friends. I will definitely be brewing more of this beer. After seeing the hop schedule for this brew, I couldn't pass it up. It was so good that I re-ordered it and brewed it again. Very smooth and hoppy just as expected. I even added more fresh hops in the mash. This will be a regular for me. I am novice all grain brewer and tried this as my first IPA. Everyone has liked it and actually converted one non home brew hater to liking it.